The Justice Department has “secretly obtained” two months of conversations between Associated Press (AP) officials in a move called “unprecedented”. The Internal Revenue Service (IRS) Cincinnati office singled out new conservative groups for extra scrutiny over the past couple of years. One of these controversies alone would have caused a headache for the Obama administration, but the two of them together could spell big trouble for the Democrats in the 2014 midterm elections. You can see how the two lines generally flow together. This especially the case after 1970 – before which time trust in government was higher than it’s been over the past 40 years. Right now consumer confidence is 76.4. That’s down from earlier this year, but it’s up significantly since 2010. 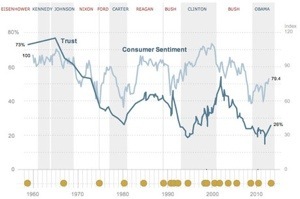 Trust in government isn’t, however, always linked to the consumer sentiment. After the Watergate scandal, trust in government remained in a relatively low stable position through 1977, even as the economy improved. Trust in government fell in response to the House banking scandal in 1992 and Whitewater controversy of 1993 and 1994, as consumer confidence climbed. Finally, the economy was improving, but trust in government fell off its post-9/11 highs through the early part of the first decade of this century as Americans angered over the Iraq War and Hurricane Katrina that pounded the Gulf Coast. Put another way, scandal can negatively impact how much Americans trust. It has to be a big scandal though. Benghazi, for instance, is likely not going to do it. Most Americans aren’t paying attention to it, and as many Americans think the Republicans have gone too far as handled it appropriately. The obtaining of AP records likewise probably makes more sense in the voters’ eyes. Obama has been critiqued for not doing enough press conferences or interviews with White House reporters. As one Democratic strategist put it, the “AP phone records thing just sealed the deal for what the newest narrative around Obama administration is going to be”. Indeed, these stories are coming at the perfect time for peak scandal coverages. Brendan Nyhan notes that scandals more often happen when the president is detested by members of the other party, as Obama is. Likewise, they are more likely to become big news when there aren’t other news stories like the Boston bombings. Finally, scandals are more likely to take place in the beginning of the second term. 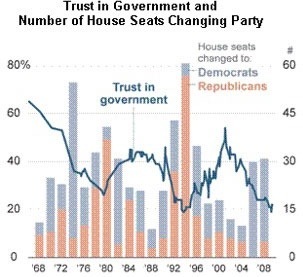 Trust in government and number of House Seats..
Trust fell dramatically in the lead up to the 1974 midterms thanks to Watergate, and the Republicans lost nearly 50 seats. Trust absolutely tumbled in the lead-up to the 1994 midterms, and Bill Clinton’s Democratic Party lost over 50 seats. Democrats took back the house in 2006 as Americans trust in the Bush administration dropped. And although it isn’t on the bottom chart, Americans trust in government, as seen in the top chart, was bad in 2010. Republicans gained 63 house seats. 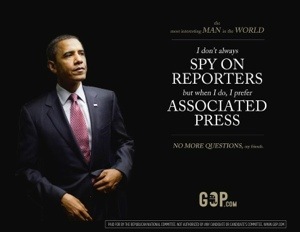 Did President Obama order that the AP be bugged? That the IRS investigate the right-wing nutjobs? Why wasn’t there this much phony outrage over the GWB when the IRS audited the NAACP, Greenpeace or Emerge America? I think it is a non-story of faux outrage. President Obama expressed himself well when he said that it didn’t matter which party you were in, you don’t want to condone this kind of outrageous behavior. If one administration deliberately engaged in having the IRS target the opposing party, the retaliation would be worse when that party came into power. He is right that it is essential that the IRS be non-partisan. Always appreciate your comment.. I think its a real story and outrage is less than appropriate! Yes! He is right that it is essential that the IRS be non-partisan. But it’s being documented right here that there is indeed administrations deliberately engaging in using the IRS as a political weapon.. I don’t like it no matter who authorizes it! Oh I totally agree with you on that. I’m saying that I don’t think it is a smear on him. It isn’t in his best interest or any president’s best interest to use the IRS as a partisan tool. You have no documentation anywhere that shows that the WH initiated anything against the nut-baggers. Why don’t you research just how the IRS/Justice actually work. If President Obama had ORDERED any actions against the lying ABC or nut-baggers please provide it. Do you even know the purpose of the 501(c)4 regulations? That groups applying for this status are prohibited from political activities? Next thing you will be telling us is that the nut-baggers were performing social services when they were stomping around carrying posters with the President’s image with a bone in his nose, with a watermelon in his arm, only his eyes showing from a black background? Besides, you have avoided my question of why wasn’t there this much phony outrage over the GWB when the IRS audited the NAACP, Greenpeace or Emerge America? Also, too, the IRS investigated left-leaning groups. Fortunately you have been proven wrong. The IRS targeted many different groups and only a measly 25% were tea party, the rest were liberal, libertarian or anti tax groups. The only ones denied the tax breaks were liberal (from TX), all the tea party and other groups were allowed to maintain their tax exempt status. It’s a tempest in a teapot and will go absolutely no where, just like the Bengazi crap. I think that Richard Nixon directly ordering hotel break-ins and George Bush bankrupting the country in a useless war against a country that had nothing to do with 9/11 are a little more scandalous than Obama being president while some low level IRS guys asked for extra audits. 1. If the tea partiers were paying their taxes they’d have nothing to worry about, just the inconvenience of being audited. Not nearly as traumatic as getting burglarized or being killed in an unnecessary war. 2. I’m not sure that they did anything wrong. If your job was to catch people who don’t pay their taxes, and you noticed that people who don’t like the government tend not to pay their taxes as much as other people, wouldn’t it make sense to audit people who joined groups that don’t like the government? I mean, why waste your time auditing somebody like me who feels like we should pay for government because it’s good for the economy, good for business, good for our children to be educated, good for keeping our air and water clean, etc. This just doesn’t seem like much of a scandal, even if it turns out that Obama was spending all his free time looking up membership lists of Tea Partiers in Wasilla, Alaska. Hi.. thanks for your comment. I agree somewhat with the job of the IRS is to (catch people not paying their taxes) However, this was politically a one sided operation using specific keywords Patriot, Tea Party! I don’t know but I can only assume that someone had to have authorized this action on behalf of the IRS or we have a rogue government entity on our hands and the’ll be coming after all of us next! What I’m seeing here is the conservative nonprofits are doing the same things that environmentalist groups, anti war groups, and labor groups, reproductive rights groups have been doing for years without any complaint. Difference perhaps.. Main stream media via Associated Press can not ignore it this time around! Representative Trey Gowdy (R-SC) spoke on Fox News’ Greta Van Susteren show: “has just been defended the Department of Justice investigation of Associated Press telephone records. The Republican congressman claims [as those of us who really follow what is going on in this country knows] it was the Republicans themselves who demanded the investigation last year. I have severe issues with any politically oriented groups who exist only for political reasons to get 501(c) 4 status. Oh, they all say they don’t exist for political reasons, but we all know they do. (Crossroads, anyone? CAP?) This is nothing but a scam on the taxpayers. The only problem with this is seeming to target only one side. That’s very much where I stand. Whatever the political party group there should been accountability! Churches seem to be falling into this pit more and more often. Nothing turns me away from religion more than politics in the pulpit. Thanks for your comment! Well now! NAACP says The IRS Was Right To Target Tea Party Groups! And who the heck are they and by what authority do they make such a claim!? Exactly!!! NONE!! The president who actually did use the IRS to go after his perceived enemies was Richard Nixon. Because of that, it is illegal for any president to direct the IRS to concentrate on any specific group or individual. A law was passed by Congress after Nixon was caught doing it. Do you really think President Obama would risk it? And as someone else said upthread, other groups – liberal, libertarian, etc.- also received extra scrutiny. They were not audited; it was just extra scrutiny to decide if they fell within the guidelines for the 501 (c) 3 and 4. The reason was because the number of groups applying for tax exempt status more than doubled, and the majority of them seem to have been tea party groups. When an organization says they’re taxed enough already and wants to receive a tax exempt status, don’t you think they should be scrutinized a bit more carefully? Only three groups were denied, and they were all liberal groups. President Obama’s ratings are going up – not down. He campaigned on changing Washington – he has changed Washington. The GOP/media (one and the same) can’t handle an honest politician so they lie. There is no lack of trust of the President. There is MASSIVE lack of trust of the media and its BFF the GOP. Thanks for your comment! However, your statement “The GOP/media (one and the same)” Are you serious? If you are– you’d be mistaken!